I love being a dentist! It’s an amazing profession that allows me to meet many wonderful people and build real connections while helping improve lives. What happens in our mouth affects our body and vice versa. That interconnection means that by helping people achieve a healthier smile I’m also helping them develop a healthier body and find more enjoyment in life. As a general dentist, in a family-friendly practice, I love caring for multiple generations and enjoy my conversations with each person. Whether I’m seeing a toddler at a first visit, improving their parent’s smile, or restoring function so their grandparent is able to eat the foods they want, I’m always focused on the person’s situation and what’s best for them. I am proud to work alongside my husband, Dr. Danny Cepeda, and our amazing team at North Appleton Dentistry. Our office has an amazingly positive and welcoming feeling to it, filled with laughter and smiles. Our patients are an extension of our family and we genuinely care about the wellbeing and happiness of each person who comes through our door. I love our team’s laid-back personality. Everyone brings something different to the table and I love that we come together to give our patients’ the best experience possible! I attended Marquette University School of Dentistry for my Doctorate of Dental Surgery. 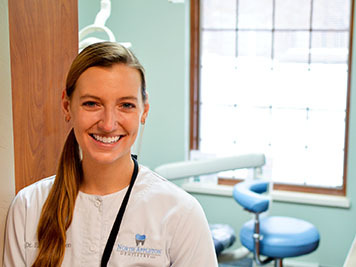 Marquette’s dental program is one of the most challenging – and respected – in the country. I graduated with an excellent understanding of the fundamental science and art of dentistry. However, like all areas of healthcare, our field is constantly evolving. The development of new dental techniques, advancements in technology, and research into new materials is happening at a breathtaking speed. It is my responsibility to stay current on these changes. Throughout the year I complete many continuing dental education courses, attend meetings and lectures, and participate in hands-on seminars. I also read a range of peer-reviewed journals and other professional publications, learning about new processes and studying research. My commitment to continual learning ensures I’m providing the most advanced treatment, the best care experience, and strongest results for my patients. They deserve nothing less. I was born and raised in Neenah, met Danny in dental school, and – once graduated – settled back in my hometown. Danny and I recently adopted a doggie we named Stella: she may make an appearance at the office from time to time! When we’re not at work, Danny and I love being outside, enjoying hiking, skiing, kayaking, biking, and sailing.